Set of 3 Table Nest. • Stainless steel tube legs. If want to change from the black to clear. 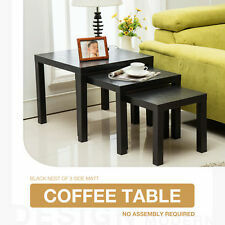 • Table 1: Width - 48cm, depth - 48cm, height - 43cm. • Table 2: Width - 39cm, depth - 39cm, height - 39cm. Set of 3 black or clear glass nesting tables. Stainless steel tube legs. 5mm thick toughened safety glass. Table 1: Width – 53cm, depth – 33cm, height – 48cm. Table 2: Width – 39cm, depth – 28cm, height – 42cm. Cara Clear Nest of Tables. The coffee and nests of tables are available in clear or black glass. Try to use the product only for it's intended purpose. Living room furniture for example is not designed for outdoor use. Cara Nest of Tables - Clear Glass & Silver. 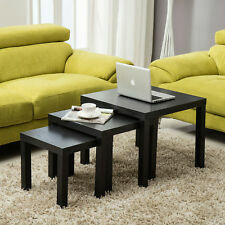 Large Table Small Table All of our furniture is of a good quality so rest assured that your item will represent value for money without compromising on quality. 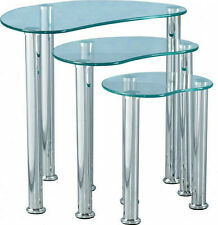 Set of 3 clear glass nesting tables. Stainless steel tube legs. 5mm thick toughened safety glass. • Table 1: Width - 53cm, depth - 33cm, height - 48cm. • Table 2: Width - 39cm, depth - 28cm, height - 42cm. 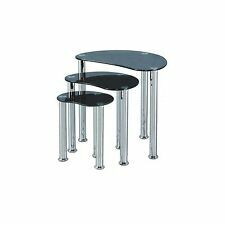 Set of 3 black glass nesting tables. Stainless steel tube legs. 5mm thick toughened safety glass. • Table 1: Width - 53cm, depth - 33cm, height - 48cm. • Table 2: Width - 39cm, depth - 28cm, height - 42cm.